The catch: The EP9 costs nearly $1.5 million. 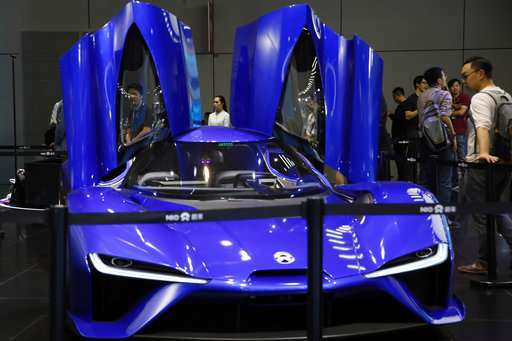 NIO, a Chinese-Western hybrid with bases in Shanghai, London and Silicon Valley, created it to showcase the company's technology and had no sales plans. But it is taking orders for "bespoke vehicles" after hearing from buyers ready to pay the eye-popping price. "We are actually pleasantly surprised how much interest we are getting," said the CEO of NIO's U.S. unit, Padmasree Warrior, a veteran of Cisco and Motorola. 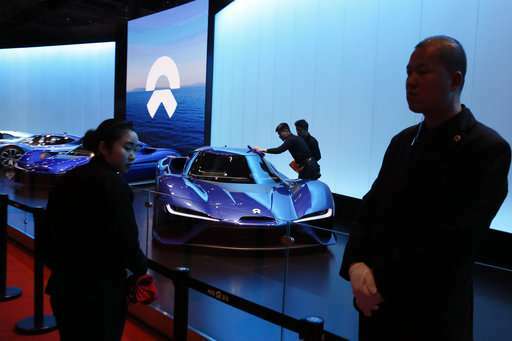 NIO is part of a wave of fledgling automakers—all backed at least in part by Chinese investors—that are propelling the electric vehicle industry's latest trend: ultra-high-performance cars. The ventures mix U.S. and European technology with Chinese money and manufacturing, reflecting this country's rise as a market and investor for an industry where Beijing wants a leading role. Communist leaders see electric vehicles as a way to clear China's smog-choked cities and as an engine for economic development. "We really haven't seen non-Chinese companies get into this super-technology market," said Chris Robinson, who follows the industry for Lux Research. 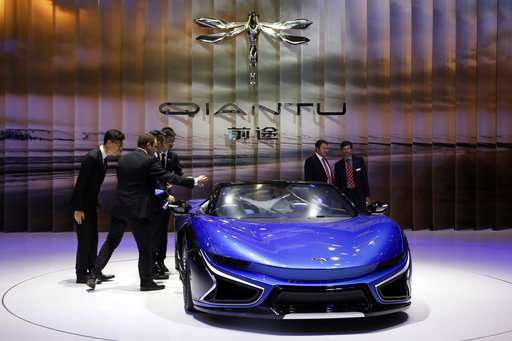 NIO's backers include Chinese tech giant Tencent Holdings, operator of the popular WeChat messaging service; computer maker Lenovo Group, a Singapore government-owned investment fund and U.S.-based IDG Capital, TPG and Hillhouse Capital. 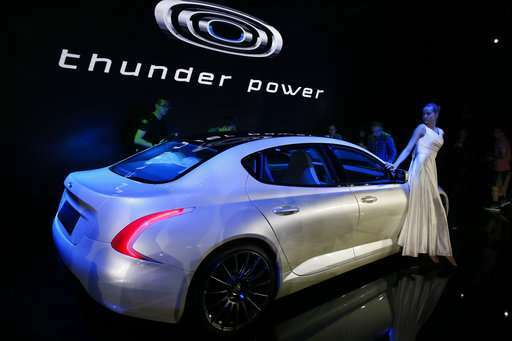 The company is building a factory in southern China and plans a second in Spain. Engineering work is being handled by Italy's Dallara Automobili, which helped develop Bugatti's Veyron, the fastest street-legal car with a top speed of 255 mph (408.84 kph). 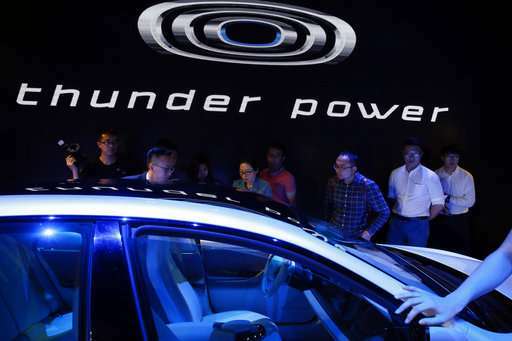 Beijing's backing has helped to make China the biggest electric vehicle market at a time of uncertainty about the scale of support for the industry from Washington and European governments. The Cabinet hopes to have 100,000 public charging stations and 800,000 private stations operating by the end of this year. Regulators are pressing manufacturers to speed up development with a proposal to require that electrics account for at least 8 percent of each brand's production by next year. Still, no matter how appealing they are, there aren't enough buyers to support so many high-performance brands, said Lux's Robinson. 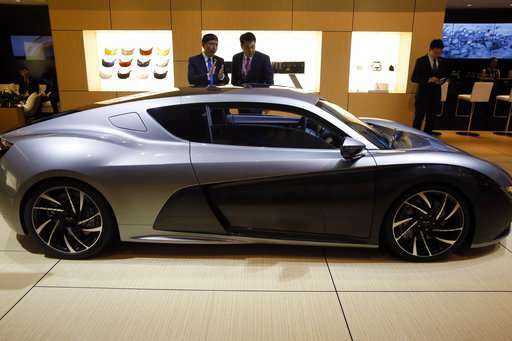 He noted Ferrari or Lamborghini might sell only 15 of their fastest vehicles, which are treated as marketing tools and even at prices above $1 million fail to make a profit. 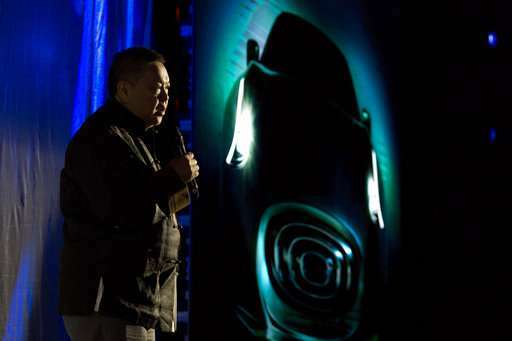 NIO's Warrior points to the transition from cellphones to smartphones, in which industry leaders were displaced by upstarts. 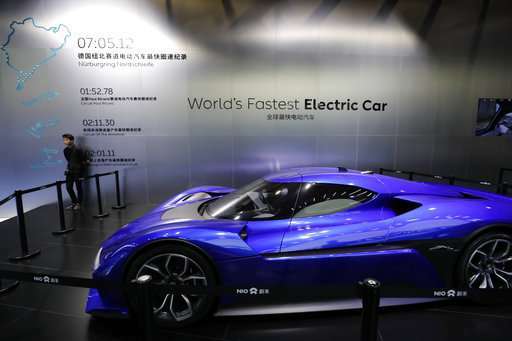 Detroit Electric's Lam said his financial plan calls for each car to be sold at a profit by 2019. "China isn't necessarily a technological leader. They are a production leader," said Robinson. "A lot of the more advanced electric vehicle, power train and other technology research is going on in Europe and the United States." I'm increasingly asking myself: What's the point of these super high speed cars? Where can you actually drive them? 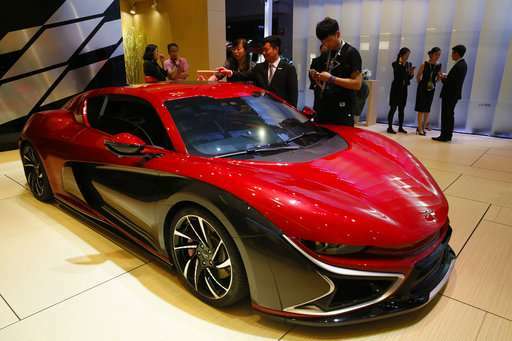 I'm sure that all Chinese are able to afford these super-cars and the cities will become clean instantly. C'mon. Invest in making affordable cars for the mass market. Enough with these toys for the super-rich. The old decadent Europe wasted its opportunity. The lazy uneducated immigrant crowds cannot compete the diligent labor force in China - on the contrary: they will burrow Europe even deeper. The immigrant problem is greatly overstated by the separatist right who only want to divide Europe and make it weak against Russia, China. People brought to hysteria about immigrants are simple tools. The actual proportion of immigrants in Europe from outside of the EU is in the single percentage points. About half the immigration is neighbors exchanging population. Even at the height of the Syrian refugee crisis, the proprtion of asylum seekers to the UK was around 5 per 100,000 local population, or 0.005% per capita. Reading the UK brexit monger newspapers, you'd have thought they were 100 million coming over. At the hight of the Syria immigration we had people voicing objections that this would 'alter our core values' in some way. I saw a german comedian (yes, they do exist) make the point quite plain. He was performing before a fully crowded hall and asked 2 random people to stand up. Then he stated "These 2 reperesent the percenage of immigrants seeking asylum. And you really think these 2 can change the core values of this entire hall?" Bizarrely the fear of immigrants is always highest in areas where the percentage of immigrants is lowest. Fear of the unknown. As soon as you come into actual contact with them you figure out: They are just regular people who want to live in peace and watch their kids grow up. Bizarrely the fear of immigrants is always highest in areas where the percentage of immigrants is lowest. It is not bizarre, knowing that fascist rhetoric uses a weak but plausible enemy as its scapegoat. Imagine a child that has been told scary stories about wasps. They've never seen a wasp except on television where this horrid creature fills the whole screen and looks like a monster. Imagine their terror on hearing that there are wasps in the garden - how easy it is to convince the child to do anything, just threatening to open the window and let the wasps in. And you really think these 2 can change the core values of this entire hall? There is a double edged sword, though. Political populists like to pretend that there is a common consesus, or "core" of values that is shared by the people, which they represent - in reality no such core exists so there's nothing to change - and at the same time the very non-existence of this core is what enables sudden shifts in political sentiment as the external situations change. So yes, the two people could shift the core values of the entire hall. First, because there are no values to shift, and second, because the very act of singling these two out of the crowd gives them the power of publicity. If they were prepared for the chance, they could hijack the show from the comedian and turn the entire hall of people against them, or against each other, or maybe do something else like start a mexican wave in people who had no prior inclination to do any of that. It isn't mutually exclusive. For Russians to have any influence over the separatists, there must be separatists in each country to begin with - and there are plenty of EU-skeptics since there is plenty to be skeptical about the EU in the first place. It's a tug of war between Brussels, Russia, and each individual nation. The main EU powers, mostly Germany but also the pro-business interests in France, would like to transform it into a federation because a completely unified economy with only nominal state borders would benefit them financially and politically. Money comes to money, so without national borders and independent policies to stop it, all the smaller peripherial states will drain towards the larger economy in central Europe. The separatists point out that this is exploitation, and the Russians fan the flames. The above is also the reason why e.g. Sweden didn't adopt the Euro, even though they technically should have had done so ages ago. It's because they have different structural costs in the society, their tax rates are different (higher), so using the same currency would not mean the money is worth the same, and business and jobs would escape from Sweden to Germany and central Europe in general. These places then, recieving the flow of money from Sweden, can afford to maintain lower tax rates because they get the necessary revenue from the increased commerce anyhow. A Euro in Sweden would be worth less than a Euro in Germany, which would kill Swedish exports and drive imports, so the exchange rate between the Euro and the Krona serves as a floodgate that stops the economy from draining away. It balances the prices of goods and services so that the internal expenses of the society cancel out, and identical goods and services are worth approximately the same in both areas.